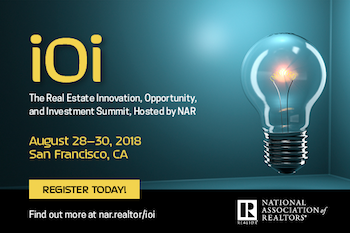 NAR PULSE—Save your seat at NAR’s iOi Summit, bringing together real estate professionals, technology innovators and capital investors for the next century of opportunity. Session topics include artificial intelligence, digital employees and regulatory forces affecting innovation in real estate. Register now! Managing and protecting listing content is of paramount concern to brokers and the multiple listing services in which they participate. In response to this concern, the National Association of REALTORS® offers many resources to help facilitate proper listing content management, including sample photography agreements, checklists and videos. Learn more about how to secure and manage your rights in your listing content at nar.realtor/copyright. Imagine if you and your family could see a doctor at any time, day or night, from the comfort of your own home or wherever you happen to be. With Members TeleHealth, you can see licensed and board-certified physicians instantly, 24/7/365, via telephone or smartphone, or tablet app, web chat or email. Get exceptional care, anywhere. Members Telehealth is available to NAR members through the REALTOR Benefits® Program. Learn more. The post Attend NAR’s Inaugural iOi Summit appeared first on RISMedia.